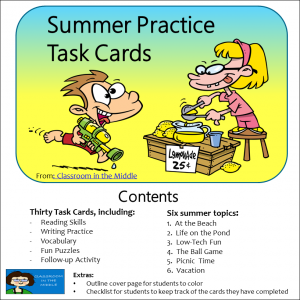 It’s that time of year – time to round up some simple, easy to use resources for kids to take home for summer practice. Maybe your kids (or their parents) want some review work to take home. Maybe you are required to send home some practice work to help students keep their skills current. Either way, some reading and writing practice activities can come in really handy right about now! Here are the summer review resources offered by Classroom in the Middle, including a FREE preview packet. Click on any of the images to read more about it and to see the preview. This packet includes six one-page reading review lessons and a novel response packet for use with any novel. Each of the six one-page lessons begins with a vocabulary warm-up. For the lessons, students use a magazine, newspaper, or other reference source to complete various reading assignments such as reading an article and completing a chart, searching for specific items to cut and paste, and researching to create an informational poster. For the novel packet, students read a novel of their choice, complete daily responses, and answer follow-up questions. 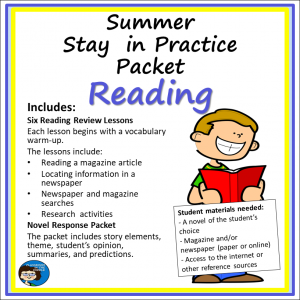 This summer practice packet contains 10 one-page lessons to provide students review of their written language skills during summer vacation. Each lesson begins with a review of editing, grammar, and spelling, followed by a short writing exercise. The writing exercises include journal writing, editing and revising. 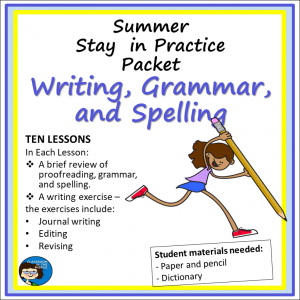 This is a simple, ready-to-go packet for students who need a little something to keep up their writing skills over the summer months. Students only need paper, pencils, and a dictionary to complete these lessons. 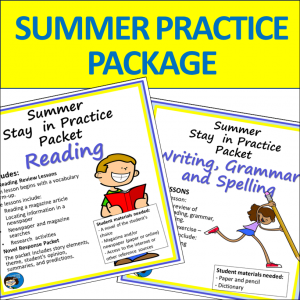 This package includes both of the above practice packets. Also included is a black and white outline cover page that students can color and a checklist for students to keep track of the cards they have completed. 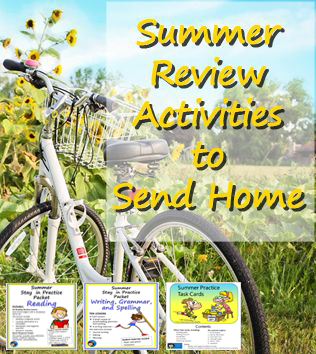 For more information about any of these summer resources, click on the image above to see a preview and to read more about it.